As I mentioned a few posts back, we’ll be spending three weeks in Italy this summer. I am usually rather cagey about our travels until we have actually arrived at the destination, but I’m doing it differently this time. I’m writing about it before we go in order to aid in my own preparation and perhaps deepen the level at which I will be writing about it during and after. I don’t know why, but I am just intuiting that it is the approach to take this time. I had not planned, intended or even hoped to go to Bologna or Parma and had not even heard of Ferrara or Commachio or Rimini two months ago, but now I can sketch rough maps of each of them, can have well-informed debates with myself about which should be included in the trip and why, and am in general counting down the weeks until we are there. This seems to be how it always happens with me. A place is at best barely floating on the edges of my radar, and then for some reason – a good fare, an article about an intriguing attraction, the desire to go to a place where no one else you know has been – within weeks my mental landscape has once again expanded just a little bit. I suppose that since there are not many places on the planet I am not interested in seeing, given the opportunity or means, this is not surprising. It doesn’t take much, in other words. But what about the 11 and 15 year old boys? What about them and their needs? 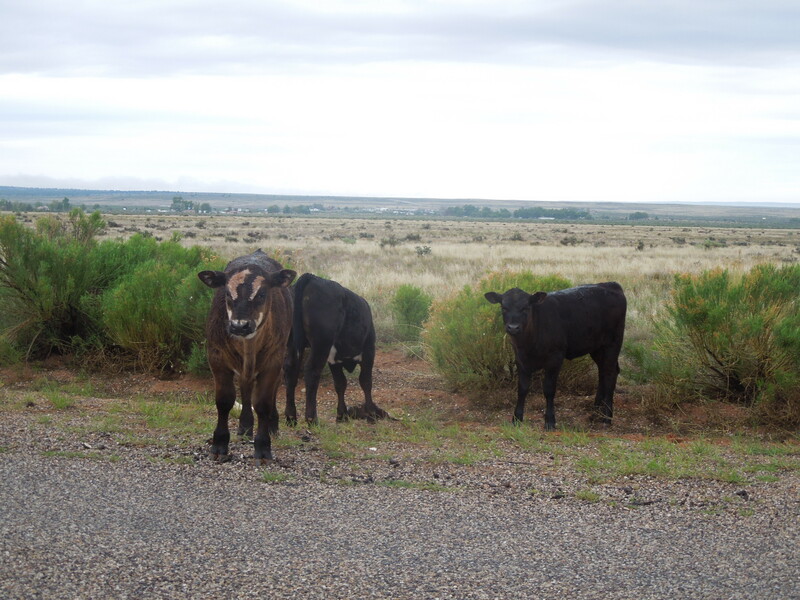 Well, these guys are great, patient, curious travelers. We are not all interested in the same things, but we all understand the value of the trade-off. You’re patient while we explore this thing that is interesting to me, and I’ll be patient later while you’re doing your thing. They are also curious about the world and, faithful to their genetic heritage on both sides, inveterate and observant people-watchers. They also just seem to trust me. I guess I have a good record as a tour guide so far. Oh, and visions of daily gelato? That helps, too. When it came to plan some summer travel, I had just a few parameters to work around: Music camp for the younger son, scout camp for the older one, and an annual scout rafting trip to North Carolina. The first two would happen in June, the last a weekend in late July. School starts in early August. I know, right? That’s life in the South for you…done with school by May 20, back in the classrom by August 8 or something ridiculous. Last year, we had a fantastic trip out West – Grand Canyon, Zion, Bryce, Death Valley and Vegas during that same time period. Well, the Vegas part wasn’t fantastic, but everything else was. Zion was probably our favorite. This year, shockingly good airfare popped up from Atlanta to points in Italy for summer travel. I mean – shocking. The ATL has had relatively little competition for international flights, and I really do think their international fares are probably among the highest from a major East-of-the-Mississip hub. Even Charlotte gets better deals and more often than Atlanta does. But I hit a sweet spot this time, and so, as I said before, we’ll be flying into Bologna and out of Pisa about three weeks later. So, first stop will be, indeed, Bologna and Emilia-Romanga. But why? Bologna is not on the top tier of Italian tourist destinations – wait, Rick Steves doesn’t even have a book on Emilia-Romagna! Should I cancel? As is usually the case, you find different opinions on the city of Bologna On The Internet. Some love it, rave and say it’s fantastic partly because it’s not heavily touristed. Others say it’s boring and dirty and worth maybe a morning if that. Because there’s nothing there for tourists. I learned long ago that with travel opinions, you just have to keep gathering your intel from all sides…and then experience it yourself. People just have such different expectations of travel – when they express opinions of a destination or attraction, it helps to know where they’re coming from, but since you usually don’t have access to that inside information, you’d be advised to keep a salt cellar next to your computer as you read. For example: When we were in France a few years ago, one of the places we stayed was this wonderful gite in the Dordogne. The other family staying in another cottage on the property was a husband, wife and teen daughter from Wellington, New Zealand, in the midst of a 6-week European tour. They had arrived from a few days in Paris, we would be traveling there in a couple of weeks, and as the dad gifted me with their leftover Metro tickets, he commented that they hadn’t liked Paris anyway. But why? Okay. I’d never been to Paris, and this wasn’t unimaginable, I thought. Big, old city. Probably dirty. Well, then we got to Paris, stayed a month, and I thought, Wellington, New Zealand must be spotless. Sure, the Metro stairwells were messy, the elevator in our station smelled strongly of urine, which I assume was from the homeless folk who stayed there at night, but..the entire gestalt of the city? Dirty? Generally? Not at all, especially when compared to (no offense) Chicago and New York City. But there are other European cities – probably German and Swiss – which are super clean, so compared to them, I suppose. Anyway, what I’ve found is that it’s best to find the kinds of travelers who live in your same general comfort zone and trust their opinions. So yes, I’m looking forward to Bologna! And what I have learned about Bologna…let me tell you. I knew nothing about the area before six weeks ago, and now, as per usual, I could teach a class. To second-graders, but still, it would be a semi-informative class on Bologna and Emilia-Romagna at a level suitable for seven-year olds. First of all, we’re looking forward to food. I am not much of a meat-eater, except for one thing: cured meats. Love salamis, hams…everything cured. So yes, this is the place for me – and for one of my sons, who is also passionate about cured meats. Cheese. Real Bolognese pasta, which is different from the sauce-heavy version we associate with it here in the US. I recently made a baked rigatoni with Bolognese sauce from Marcella Hazan’s Essentials of Italian Cooking, and it was a revelation. We are doing a food tour that starts in Parma – a parmesan cheese facility, a winery, a balsamic vinegar facility in Modena, and a Parma ham/cured meat joint. Plus lunch. I hardly ever do tours, but this is the most efficient way to see all of this, and plus…maybe I’ll learn something? From another person instead of just from a book? Cars! I don’t give a flying flip about cars, but my 15-year old who just got his learner’s permit has a steadily growing interest, so we might check a tour or museum out. Ferrari, Lamborghini, Maserati, and Ducati all have either factories or museums in the region, so we’ll try to find one with the best cost/satisfaction/time ratio. Bologna is known for its porticoes – or covered sidewalks. They’re UNESCO-worthy. 53 kilometers of them, including 3.5 km that go outside the city, uphill, to the Shrine of San Luca. We will do this! The oldest university in Europe, including the 17th century anatomical theater. Some interesting museums, including those featuring archaeology, industry and even anatomical models. We’ll see what we can squeeze in, especially taking into consideration those crazy Italian opening/closing hours. Of course, Catherine of Bologna, sitting up, waiting for us. And St. Dominic! Why did I not know that St. Dominic’s tomb is in Bologna? The complex of Santo Stefano – modeled, it is said, after the Church of the Holy Sepulchre in Jerusalem, originally seven churches, now four. Next up: We’ll miss Siena’s, but Ferrara has a palio, too. Who knew? Well, the Ferrarans, but besides them…. Tomorrow or the next day, I’ll talk about the research and prep I’m doing – which is an addicting pastime for me, but at least it’s educational and not a complete waste of time. And just to let you know, I plan to up my social media game on this trip, not to a distracting point to us, but just for the purpose of sharing intriguing images and vignettes, especially from places that are less familiar to American travelers. What I post is generally not about me or much less my kids, but about what I see and how I see it. So if that interests you, be sure to start following me on Twitter, Instagram and on Periscope (same handle as Twitter – I have not broadcast yet, but will probably start practicing soon.). I have a Pinterest board here with some of the links I’m saving for myself – when I remember to pin them. Facebook remains mostly for actual acquaintances and family members, although I might start just linking these other social media to the Charlotte Was Both page. That’s probably a good idea. Let’s do it! And if you have suggestions regarding this area…please share them! Okay, I need to finish this! Left Birmingham on 5/19, flew to Vegas. 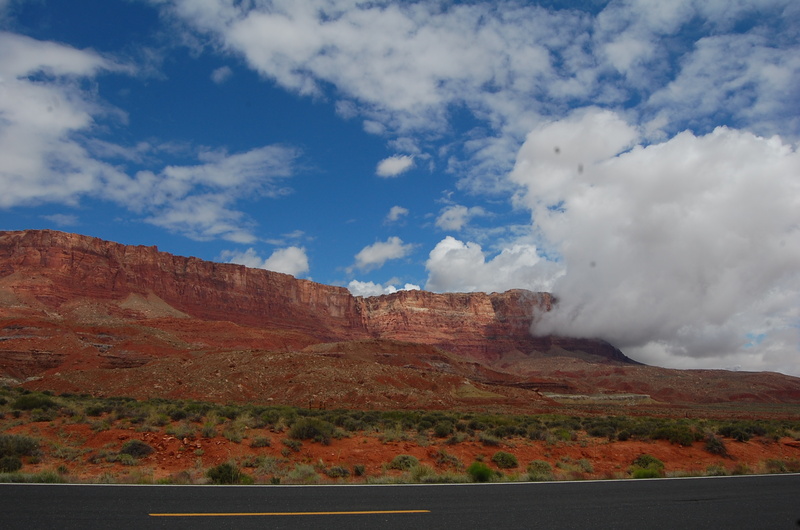 5/20 – Hoover Dam and then on to Saint George, Utah. 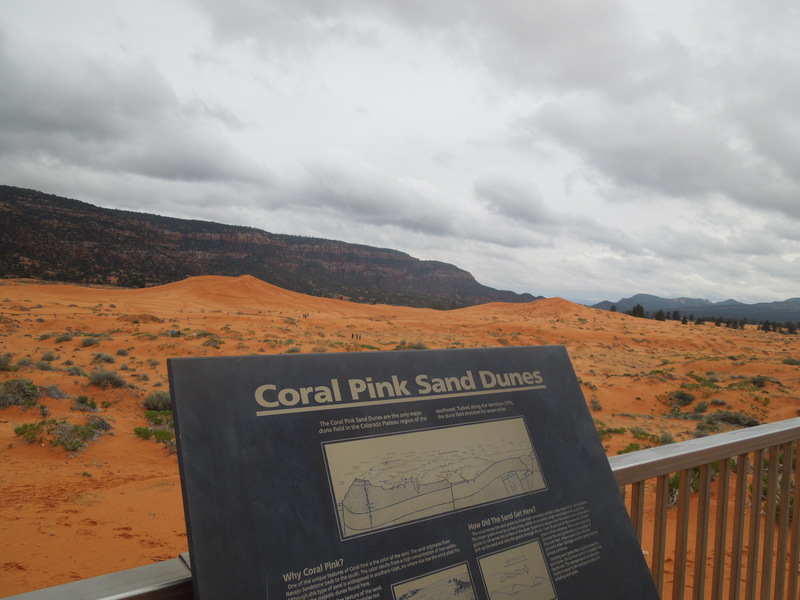 5/23 – drive down to Kanab, Utah – Red Rock Canyon and Coral Pink Sand Dunes on the way. I enjoyed every single spot we visited, had my breath regularly taken away, and was impressed by the national and state park infrastructure at every turn. However, I’d say that Zion National Park is the one to which I’d return. We barely scratched the surface on our visit, and there is much more to do and see than we were able to even begin to try. 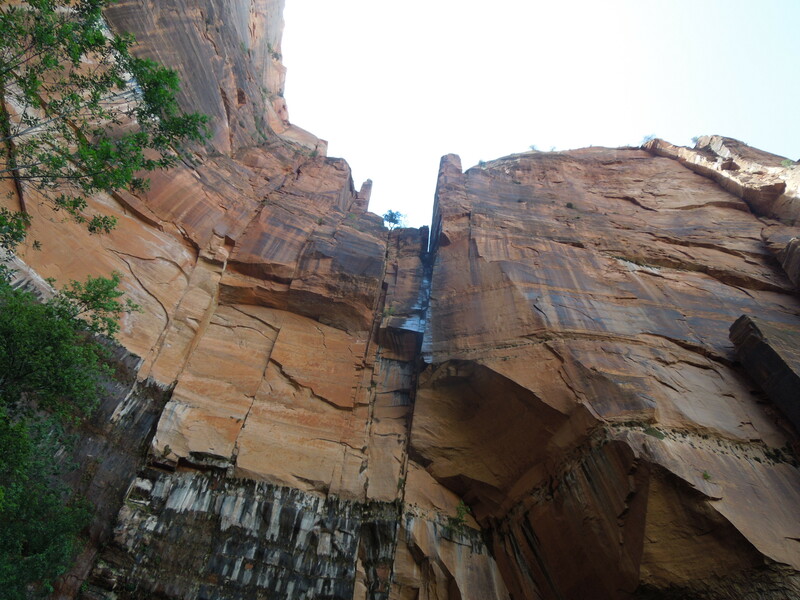 There are two main entrances to Zion National Park – one to the west, and one to the east, north of Kanab. We were coming from the Grand Canyon, so toggling west would be out of the way and take longer, but I was given pause by guidebooks’ descriptions of the SCARY WINDY CLIFF-HANGING nature of the east entrance. I mean, I’ve driven some windy places before – Sicily and the Pyrenees, for example, but still. This sounded treacherous! The one thing I would say, however, is that going this way requires you to go through a narrow tunnel, and the line of cars can get backed up for that. We didn’t have to wait too long, but I imagine that during the height of summer, the wait is considerable. But windy roads…you don’t scare us! And more than that, the prize for going in that east entrance? After surviving the not-scary drive, we made our way to Springdale, which is the little town at the west entrance of the park and where the closest accomodations are located. We found lunch at a Mexican restaurant, then checked into the hotel, which was Flanigan’s Inn, which I liked very much – it had an eastern, spa-like vibe, but the price was decent for the area, and the employees were probably the nicest of the trip – and on a trip through Utah, that’s saying something – because everyone is nice there. Not our hotel, but iconic. This is how close Springdale is to Zion. Basically in it. Springdale is right at the entrance to Zion, so what’s great is that you can walk everywhere, including to the park, and there’s a shuttle system that runs up and down the main drag of Springdale itself and to the park entrance. Then back down to the shuttle which we then took to the end to the Riverside Walk and The Narrows. 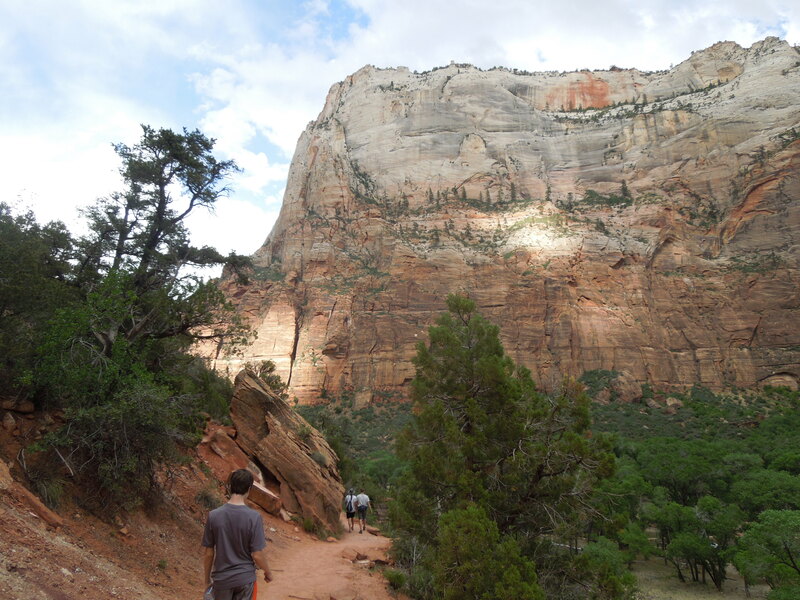 On the way, we looked at Angels Landing – one of the most famed hikes in the country, and one which I will never do – and saw several rock climbers ascending sheer cliffs, along with their cliff-tents thumbtacked into the cliff face. Sheesh. So we did our exploring, had a great time, and went back on the shuttle. Ate dinner, etc. The next day was going to be biking. Since there is no car traffic on the Canyon road, only the shuttles that come by every few minutes, the road is open to bikers during the summer, and considered safe. We first did the Pa’rus trail, which is just that – a walking and biking trail that runs along the Virgin River. It also runs along the campgrounds, and although I’m not a camper, I’d say that if you are, camping at Zion, with that scenery, would be gorgeous. Then we hit the road! I didn’t have a plan. We would just go as far as we could – I was hoping we could make it to the end of the road (the Narrows.) What I hadn’t counted on, however, and really hadn’t considered, was that the road into the canyon is mostly uphill. It was a bit more challenging than I had expected, so we stopped at The Court of the Patriarchs, waited for a shuttle, loaded our bikes on it (you can do that) and took the bus down to the end – it would be downhill all the way back, and that might be fun, right? We made one stop – at Big Bend, where we parked the bikes and walked down to the river, then coasted all the way back. It’s very safe – I wouldn’t do it with a five year old, but if a kid is steady on a bike and understands that the minute you see or hear a shuttle bus, you are to pull over and stop, it’s fine. We really enjoyed it! But then…it was time to move on. See? Not enough time. We’d definitely return and explore more. 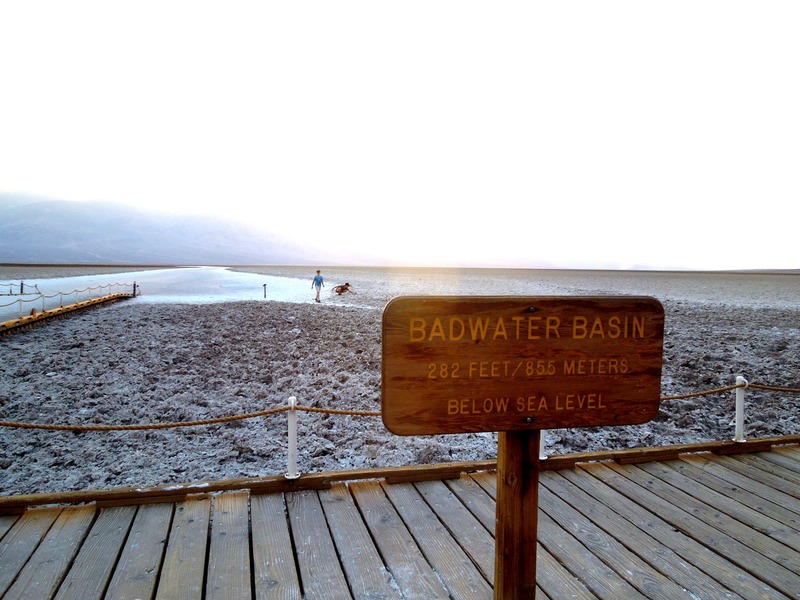 The next stop would be back to Saint George, explore a bit around there, and then on to Death Valley – a pretty long drive – the next day…. As I think I said before, it really is Grand, no matter why it’s named. All of my anticipatory cynicism was blown away by the real thing. 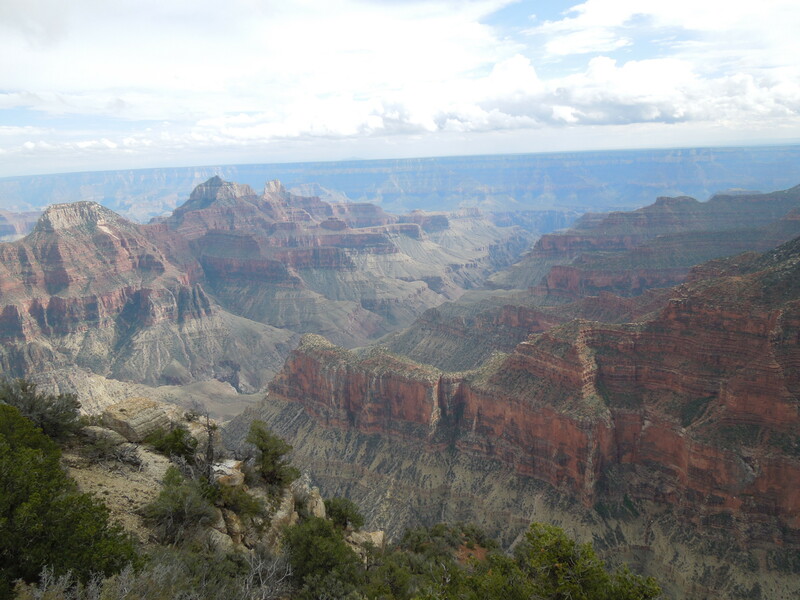 But because this series has gone on just too ridiculously long, I’m going to finish up the Grand Canyon portion – Sunday, May 24 to the morning of Tuesday, May 26 – as succinctly as I can. Our Sunday route, as I explained before, was a rather convoluted one from our AirBnB near Fredonia, Arizona, back up to Kanab, Utah for Mass, and then back down to the Grand Canyon. We stopped at the Jacob Lake Inn, which has a famous bakery, bought some baked goods, saw snow (the North Rim Lodge had opened on the 15th..in the midst of snowfall) and at that point, it was still a little early. 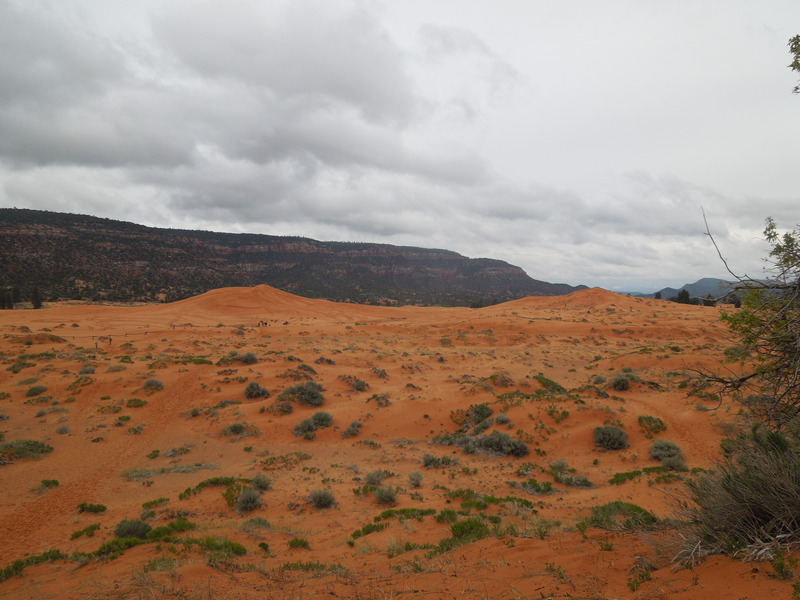 As I recall, it was before noon, and we couldn’t count on getting in our rooms until four, and we would have a full day tomorrow and as much time as we wanted on Tuesday for the Canyon, I decided to take a little detour – to the Vermillion Cliffs. All we did was drive (I had bought the boys sandwiched at the Jacob Lake Bakery, so they had sustenance..after having risen at, um, 6:30 AM or whatever it was. But it was a stunning drive. There’s a point at which you pull around a curve on 89A, having just driven through woods – you see an overlook, and beyond you, to the north, you see them. We drove down and around a bit, but there was really nothing to “do” in the area in which we drove except be amazed, and I’m the only one who can sustain that for longer periods of time, so early afternoon, we turned around and headed back. 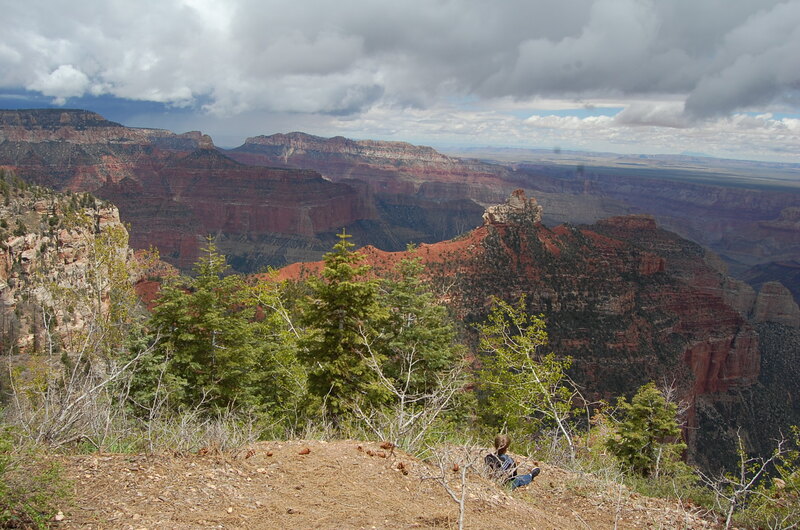 Remember, we were at the North Rim. The entrance to the park is about 12 miles or so from the Lodge. You drive and drive – hoping to see the famed bison and deer in the meadows (we didn’t – they are probably active at night) – and finally you’re there. 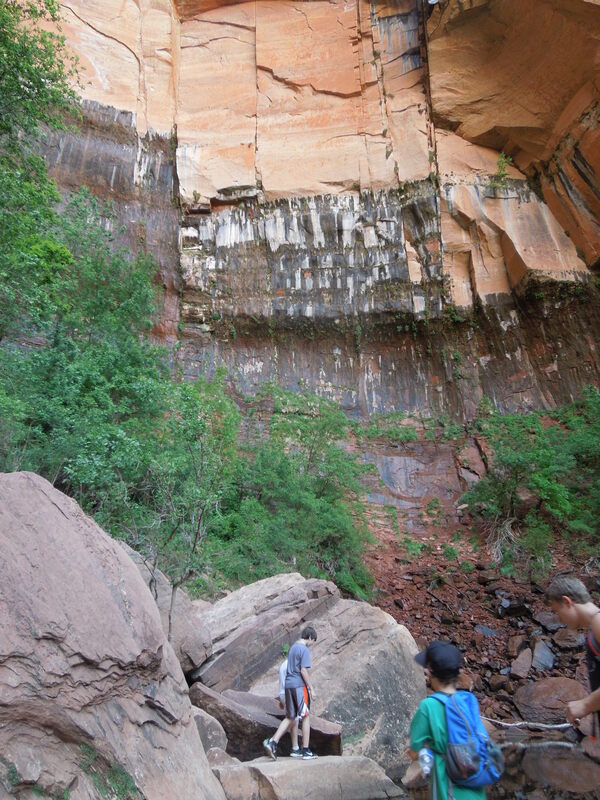 Then our first “hike” – the ritual Bright Angel Trail hike. 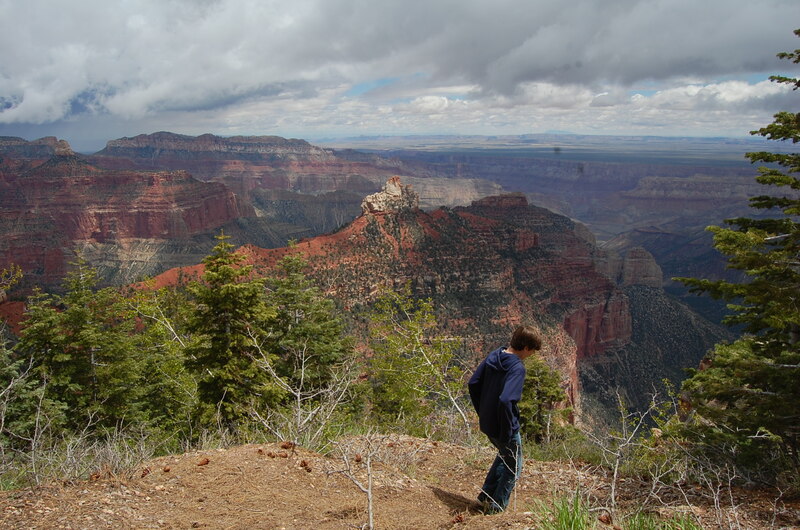 This begins at the Lodge, is paved, and follows a short portion of the rim out to Bright Angel Point, which juts into the Canyon. Along the way are various other jutting points, unguarded, on which people like to stand and do daring things. I was nervous just watching people I didn’t know pull these stunts. After a dinner of pretty good pizza from the café, we settled in for the night. I went to do laundry at the campsite, the boys took a screen break. The next day, we drove and walked. 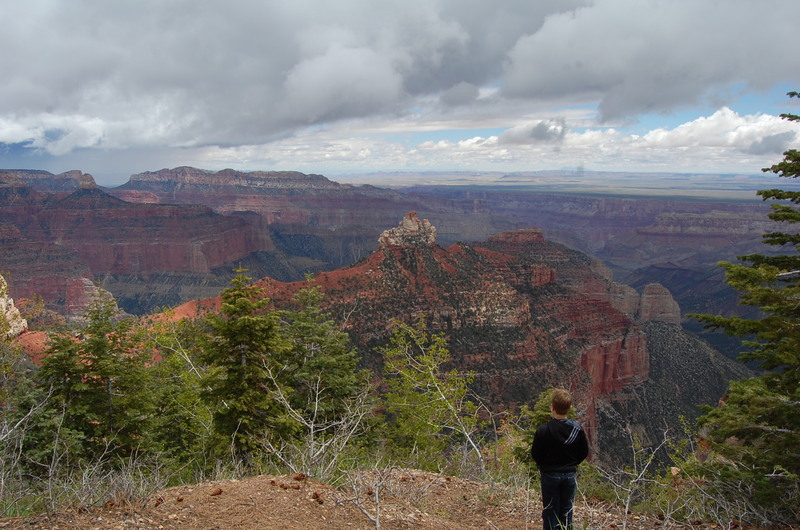 You can see a lot of the North Rim via driving to various points, and considering the North Rim is less visited, and it was quite early in the season, it was very easy to do – efficient! They spent a lot of time searching the rocks. The older boy found a geode early on, so the competition was on…. This was also the parking lot where I backed into a small pine tree that jump behind my car. I took a bit of paint off and left some tar. I worked hard to get that tar off before I dropped car off and waited for several weeks for some demand for restitution, but apparently either there were enough other scratches on the bumper or those car rental agencies in Las Vegas are used to cars being returned in much, much worse shape than with a quarter-sized patch of paint missing…. 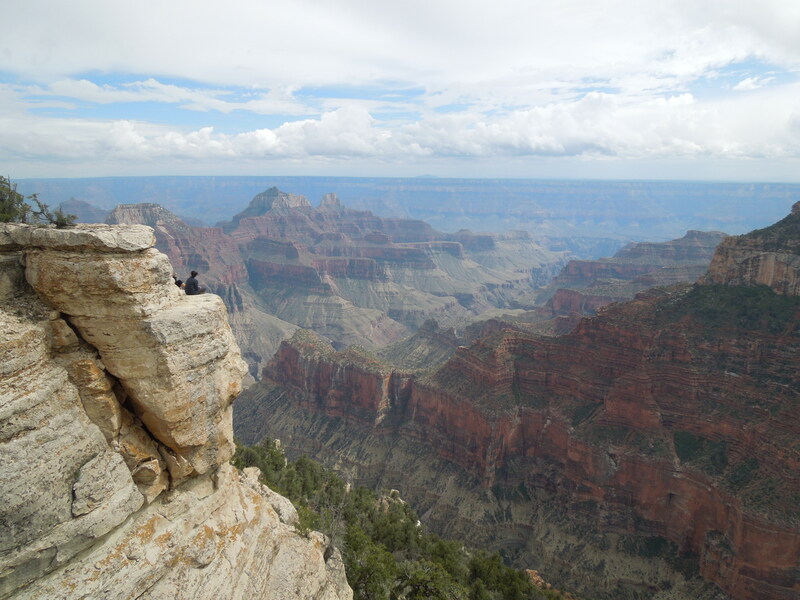 It’s a great drive, and the odd thing is that even though you think, “Why do I want to stop and see the Grand Canyon from different viewpoints? I mean…is it really that different every time?” Answer: yes. As I recall, after all of that, we returned to the Lodge for lunch. Sandwiches, which were good and not outrageously priced. After that, a bit of a rest, then back on the road. We drove to the parking lot for the North Kaibab Trailhead – this is one of the trails that goes into the canyon and by gosh, we were going to do it! We wouldn’t, of course, go all the way to the canyon bottom, but I wanted to attempt to get to the Supai Tunnel (are you laughing yet?) – four mile round trip. It would be our only activity for the rest of the day…..
I’ll add at this point that I was annoyed that the visitor information in the Ranger station didn’t tell us much about this trail. The information was certainly there for the asking, but it wasn’t being suggested – but why? Why were they holding back? What did they think we were? Wimps from East of the Mississippi? It didn’t take long for me to figure out why, in fact, this trail wasn’t pushed on the casual hiker. It’s hard for a couple of reasons. First, and most importantly, it’s really hard coming back up. Because, of course, you’re coming up the canyon walls. As it turned out, we got to Coconino Overlook (.7 mile down) and that was enough. We all agreed that the hike back up was going to be challenging enough at that point, and we had no need to triple the distance. We couldn’t even. 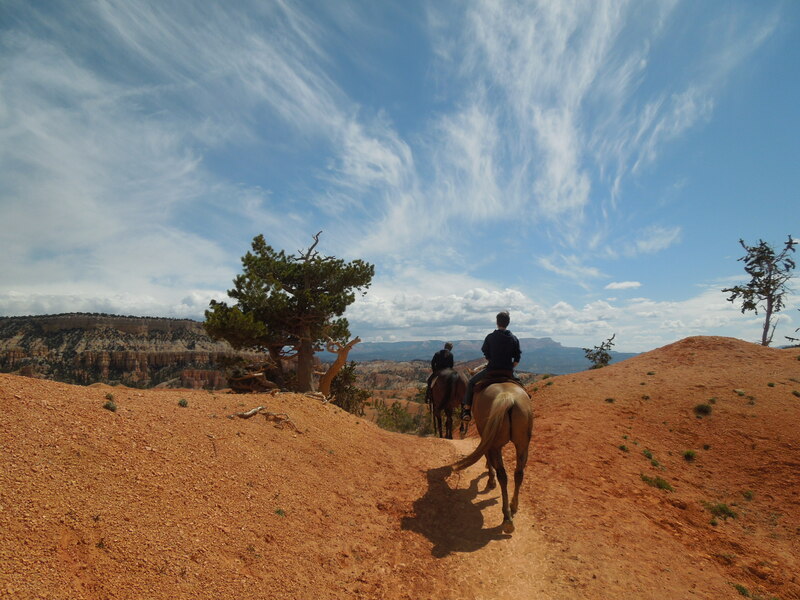 The second reason is that this trail is also used by the mules. 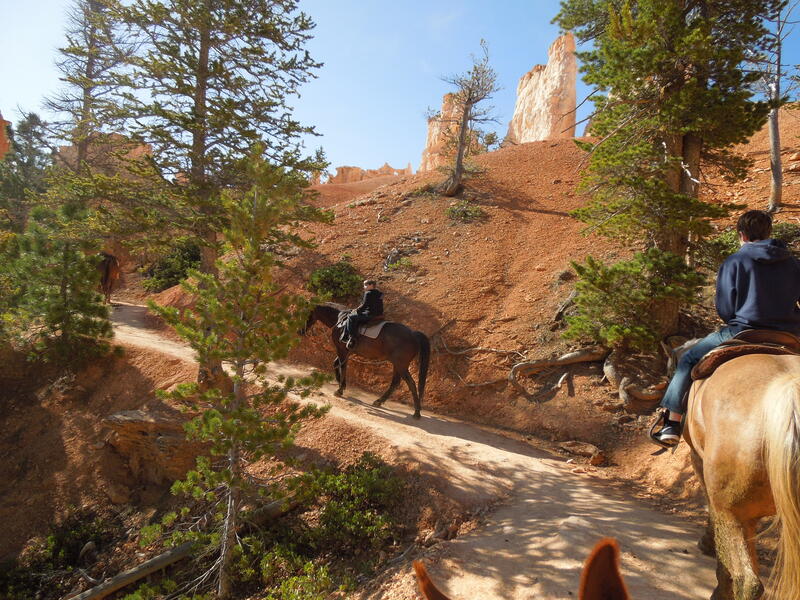 You also share trails with mules and horses at Bryce, but there’s a difference: Bryce is dry and deserty, and the trails are wider, sandy and gravel-y. 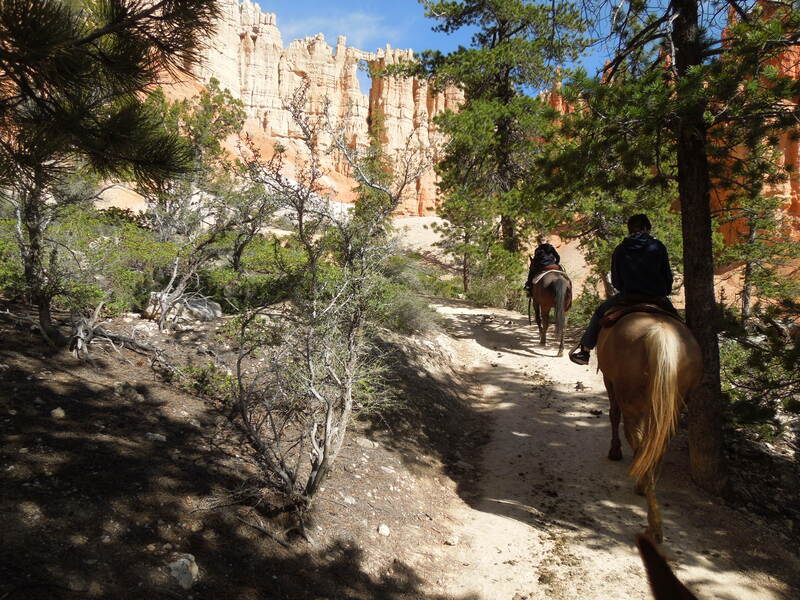 The North Kaibab trail is narrow, is in forest and is mostly dirt, which means in the spring it is muddy and also that the animals have no room to do their business (which they do frequently on the trail rides) except on the trail. It was kind of a mess. 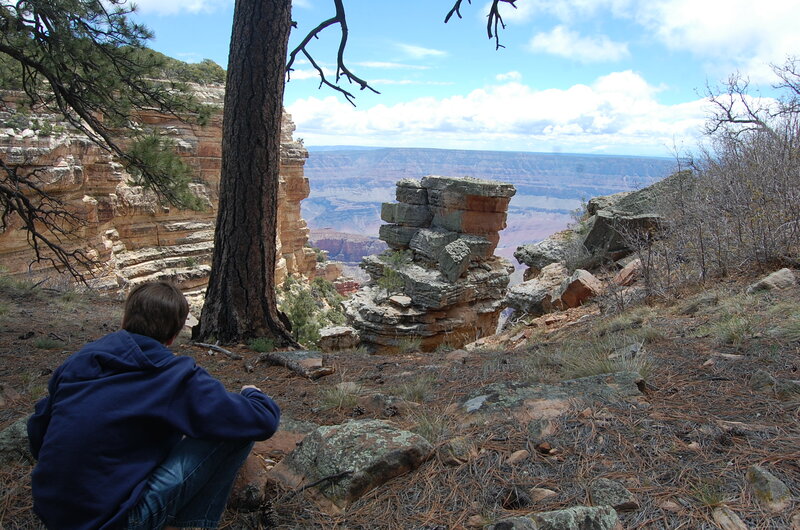 It was a pretty gross mess at times, with no way to avoid it all except by stepping into Grand Canyon. Despite the relative difficulty and the mess, I’m glad we did what we did – I would hate to have gone without hiked even just a bit down into the canyon. Finally, we headed up to Imperial point. 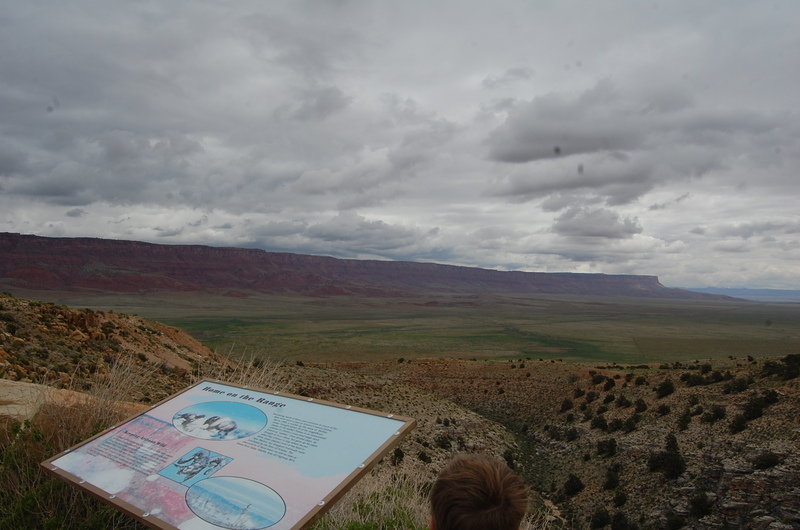 You could see so much of the canyon, plus so much of what lay to the north, including the Vermillion Cliffs. And that was it….you can see that even if you’re not a big hiker, you can easily see what the North Rim has to offer in a (long) day. I suppose it’s a copout for the backcountry folks, but that’s not us, and I although I harbor thoughts of someday, if I stay healthy and in shape, attempting a Rim-to-Rim, I was very satisfied with what we experienced in a day and a half. When we last spoke (about this, anyway), it was Saturday evening, and we were snug in our bunkhouses somewhere west of Fredonia,Arizona. The next day we’d make our way to the North Rim of the Grand Canyon, but first things first: Mass. Kanab, Utah was really our only choice in the area. Yes, there would be backtracking from our Saturday night space, but we would have to go almost all the way back to Kanab anyway to get to the road south, and it’s gorgeous country, so I won’t complain. Now, those of you who are familiar with the area are probably already thinking….uh-oh…. We were sleeping in Arizona. Arizona, like Utah, is in the Mountain Standard Time Zone, but does not observe Daylight Savings Time, so at the time we were there (late May), when we were in Arizona, we were in the same time zone as we had been in Las Vegas, the origin of our trip, and where the rental car was obtained. Vegas is in the Pacific Time Zone. We would be going to Mass over the border in Utah, which is in the Mountain Standard Time Zone, but does observe Daylight Savings Time. So, Mass was at 9am, but that would be 8 am according to where we were sleeping. No problem. I mean, going between time zones is a given when you’re traveling, and being that where we live (Alabama) is in a different time zone from places we go often on day trips (Georgia, South Carolina and Florida), this is not rocket science. So. Church was about 30 minutes away. Just to be safe, I said, let’s leave at 7. Which would be 8 Church Standard Time and would get us there, if we drove at a leisurely pace, about 20 minutes early. So, I set my phone – which functions as my alarm clock, as I’m sure it does for many of you – for 6:30 am. In the morning, it went off, I got up, got myself ready, then awakened the boys. We packed up, I called the owner to check out, as instructed, we piled in the car, I turned the ignition, the dashboard lit up, and the clock – set to Las Vegas/Arizona time – blinked on. It didn’t take me long to figure it out. The day before, I had not used my phone from the time we drove out of Utah to the time we arrived at the bunkhouses. 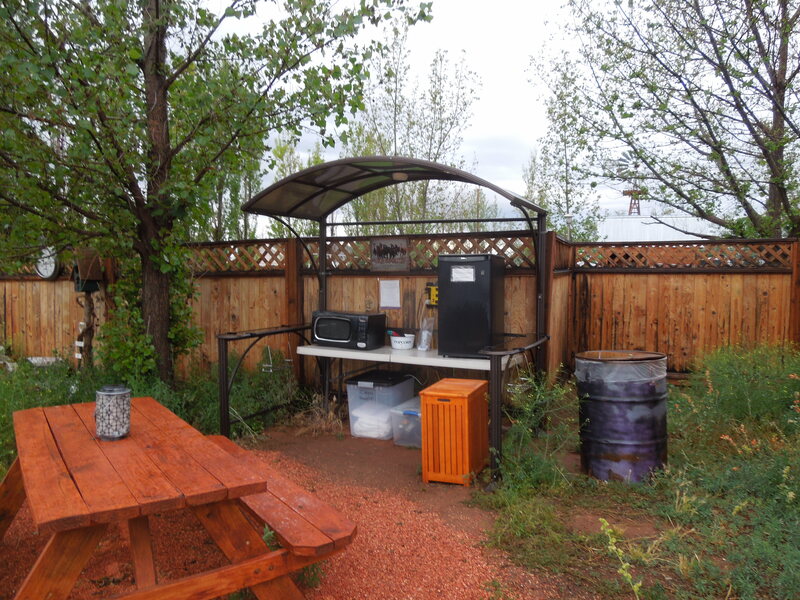 Most of that drive was through an sparsely populated Native American reservation, and there, as here at the bunkhouse itself was….NO SERVICE. My phone had never connected to Arizona cel service, so the clock was still on Utah time. That time when your Mom apologizes a zillion times for getting us up at 5:30 for no reason? Yeah, that. There was no sense in unloading and going back in the bunkhouses for just an hour. 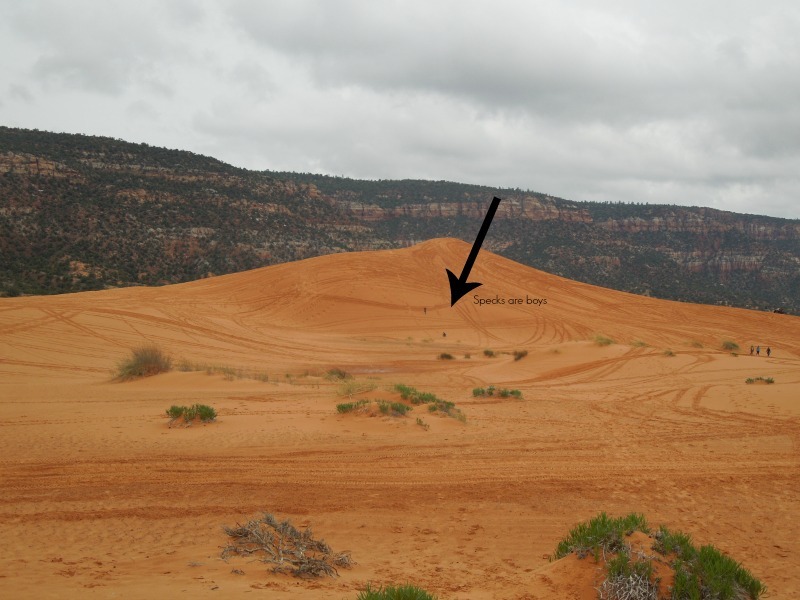 I wasn’t tired, so I told them I was just going to drive around and see more of the country around Kanab. Eating wasn’t an option because by the time we actually got to Kanab, we’d be hitting close to the 1-hour pre-Communion fast, and that cuts it close for me – I prefer the three-hour fast anyway. So…I drove around. The 14-year old fell back asleep pretty quickly, but the ten-year old stayed awake, and got to see a huge jackrabbit for his trouble. Live, as they say, and learn. Sheesh. St. Christopher medals and a prayer card for travelers. It’s a great idea for any parish in a heavily-touristed area. They did do the “raise your hand and tell us where you’re from” thing at the beginning of Mass, but I will say that it was actually before Mass started, so I guess I can accept that. 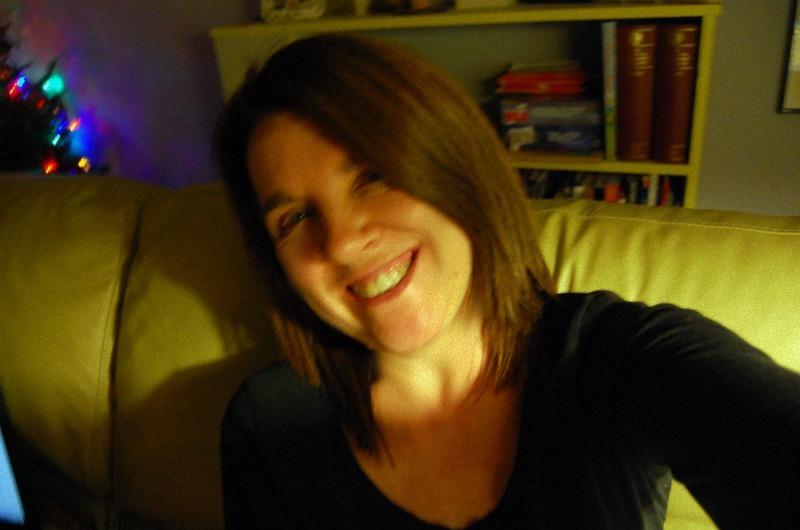 (I didn’t raise my hand, though, and the boys knew better…not that they’d want to enter that fray, either.) They had donuts, etc., after Mass, but we didn’t go because, hey, I wanted to drive even more before noon. So… today’s lesson: welcome your travelers. And don’t assume your phone is always telling you the truth. That’s trouble. Well, we’re up to Saturday, May 23….at this rate, I might get this trip report finished before the next trip. Pin down rooms at the Grand Canyon North Rim Lodge, which I had believed would be the most difficult to obtain (in retrospect…no. But more on that when we get to Sunday). Then work everything else around that. The difficult issue was that Memorial Day Weekend falls right in the middle of this, and I had a heck of a time finding rooms that weren’t $300 a night for that Saturday night. (Sunday and Monday were GCNP nights, and I checked many times a day, but nothing ever opened up for Saturday. It if had, I certainly would have grabbed it). There are two lodgings not ridiculously far from GCNP North Rim – in Jacob Lake, about 45 minutes out, and then another lodge a big closer. Neither of them had Saturday night vacancies. I thought I had checked Kanab – just over the border from Arizona in Utah – out pretty thoroughly, and nothing reasonable ever came up. 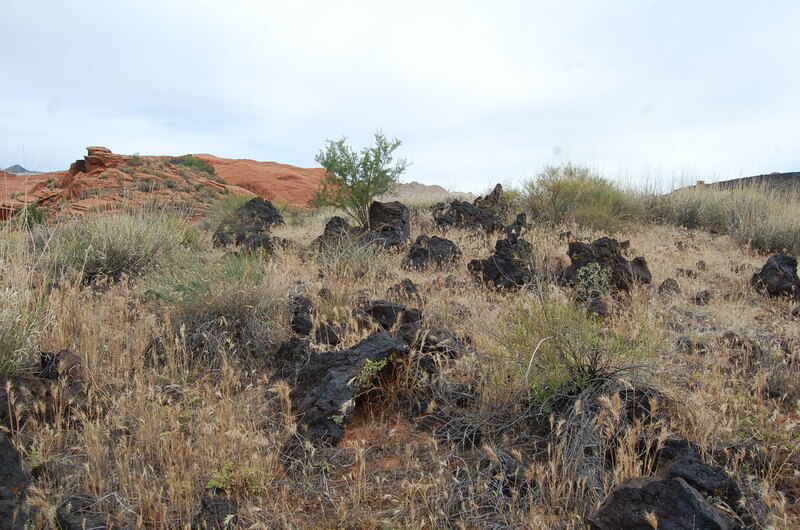 However, I’ll say now that when I drove around Kanab both Saturday afternoon and Sunday morning…I didn’t see packed parking lots in the hotels. I’m going to guess that the chains that came up on Kayak were either indeed unavailable or too expensive for me, but there might have been independent motor lodges and such that weren’t listed on those aggregate engines. 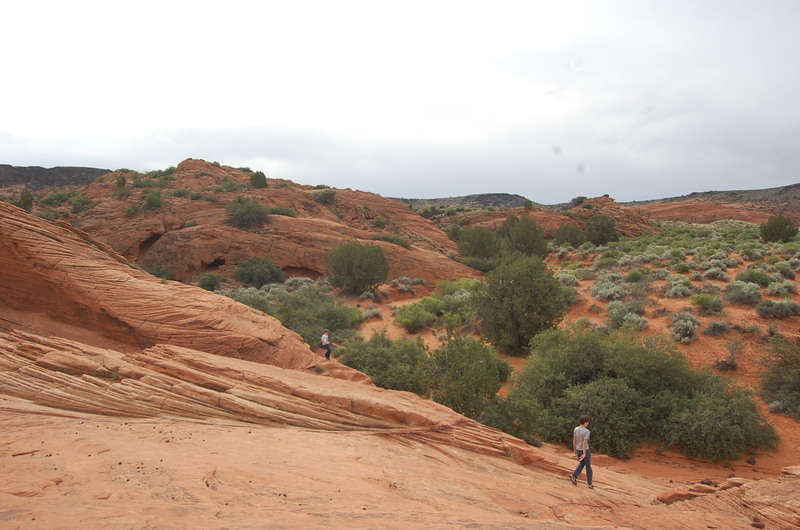 It turned out fine, and we had an adventure, but staying in Kanab would have saved me a bit of driving…a trade-off. But that’s the way it is with [insert Life Lesson and Metaphor here]. 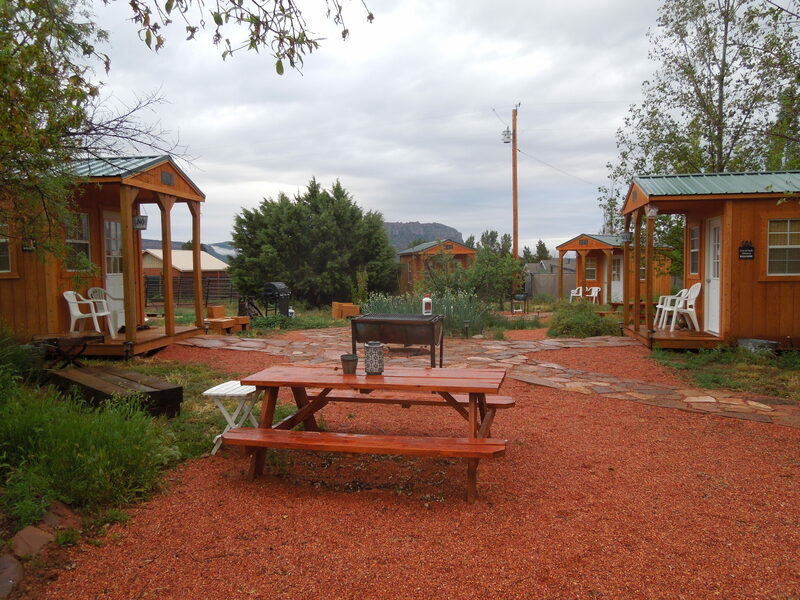 SO, where we ended up for Saturday night was this, via AirBnB – two little “bunkhouses” just a bit south of Colorado City (does that ring a bell? Well it just might….). That would be our goal for the end of the day, but in between Bryce and that spot was a lot of space and all day, so…time to set out and find stuff to do! 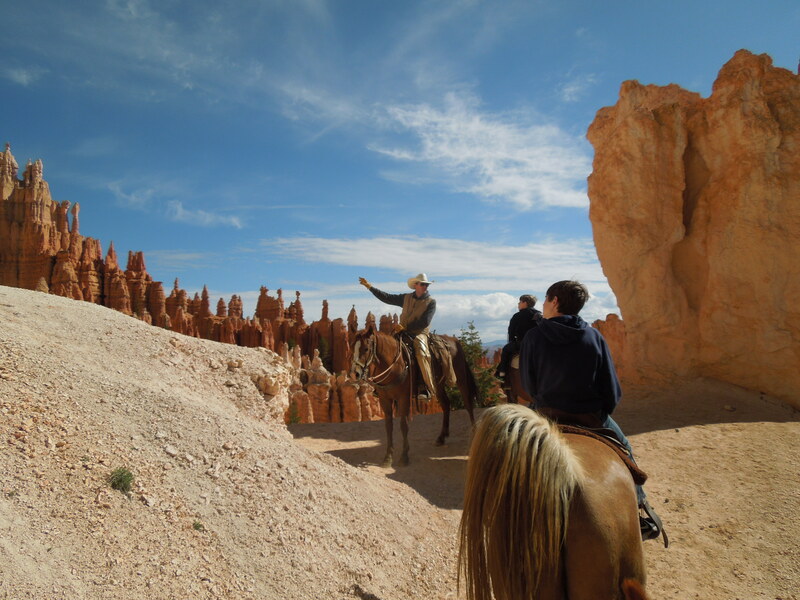 First stop, very close to Bryce, is Red Canyon – which is certainly red! We only spent about thirty minutes here – a place where Butch Cassidy is supposed to have used for a hideout – but you could certainly spend all day, at least. Then we’d catch 89, and take it to Kanab. Every town along the way had at least one historical marking, each telling the tale of yet one more Mormon settlement. 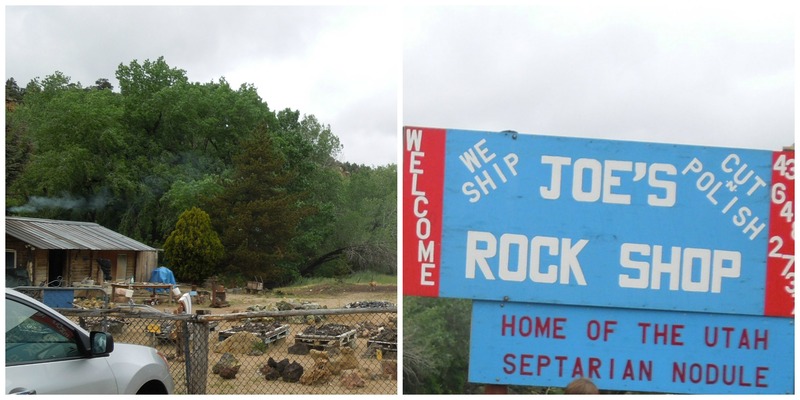 Rock shops are also very common, not surprisingly, and we stopped at one where we learned all about the Septarian Nodule – Geode-like, but not really – and bought a few things, including some small pieces of petrified wood. 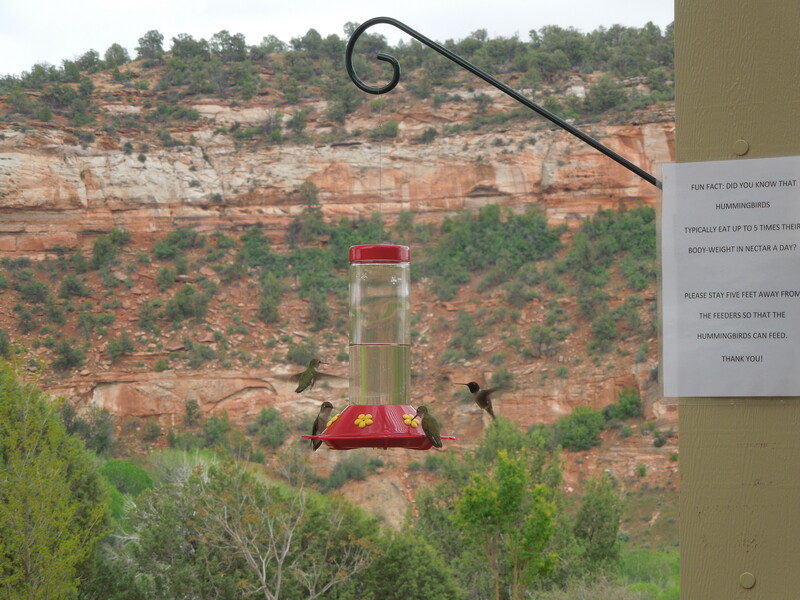 The owners gave us restaurant advice, but we didn’t take it, continuing on down to Kanab. Kanab is a small town, but it’s a pretty busy gateway, with several hotels, including the Parry Lodge, famed for the movie stars who stayed there back in the day – the area was a popular location for shooting movie Westerns. I actually thought I’d gotten a room there when I was on the search for Saturday Sleeping, but the woman called me back five minutes later and said, oops, she’d made a mistake. Alas, no spirit melding with Tyrone Power (my mother’s favorite) this time. There’s a terrible “Little Hollywood Movie Museum.” I mean – it’s the worst. You don’t pay to walk around the purported sets collected behind the shop, but you know things are in a sorry state when you feel ripped off…. by a free attraction. I hadn’t heard of any of the movies except McCabe and Mrs Miller , and all it was was a collection of shacks and false fronts (which is all it would be, I know). There seemed to be a small foreign tour group there that was being led through and being invited to dress up and play with fake guns, but I didn’t stick around to see. It was just awkward. Lunch was good – at this great little pizza buffet called Lotsa Motsa. Just what everyone needed. I always tell my kids when we travel that when they have a chance to eat…EAT A LOT. Because they never know when they’re going to get a chance to eat again. Sound sad? Well, that’s just how our days tend to go on the road, and it’s especially how it can go when you veer into “picky eater” territory. So they’ve learned: eat what’s there, when it’s there. A pizza buffet was perfect, and the pizza was actually good. It was a popular place, too – crowded with obvious tourists from all over world, although the group of Asian tourists walked in, then walked right out, back across the street to McDonald’s. It was early afternoon by then, and we had plenty of time to Do Things, so I decided that we should head back up north a little ways to Coral Pink Sand Dunes State Park. On the way, we made one stop, however, at the Best Friends Animal Society. This is a huge no-kill sanctuary spread over thousands of acres. Folks go and spend days or ever weeks volunteering at the facility. They do offer tours, but they are lengthy, and you have to reserve them ahead of time – we missed the opportunity, but that’s fine. I respect the work that they do, as well as their decision to be a refuge and a sanctuary and not a zoo, open to drop-in gawkers like us. Such an interesting place. The red rocks from two more or less parallel mountain ranges blow off into this valley and form enormous dunes of, well, pinkish sand. What’s unique is that the park is open to both foot traffic and ATV’s (you can see the tracks in the photo), so while you are not going to get a peaceful afternoon in the dunes, ever, probably, everyone seems to respect each other and make way. We probably spent two hours there – the boys had a great time wandering and playing their imaginary games, whatever they are about. I walked a bit, and then just sat and sand dune and people watched. There’s a small visitor’s center with super nice folks who talked to me about one of the things that had started to obsess me – finding petroglyphs and dinosaur tracksites. The woman told me of a couple of near-ish sites and I filed them away for consideration. 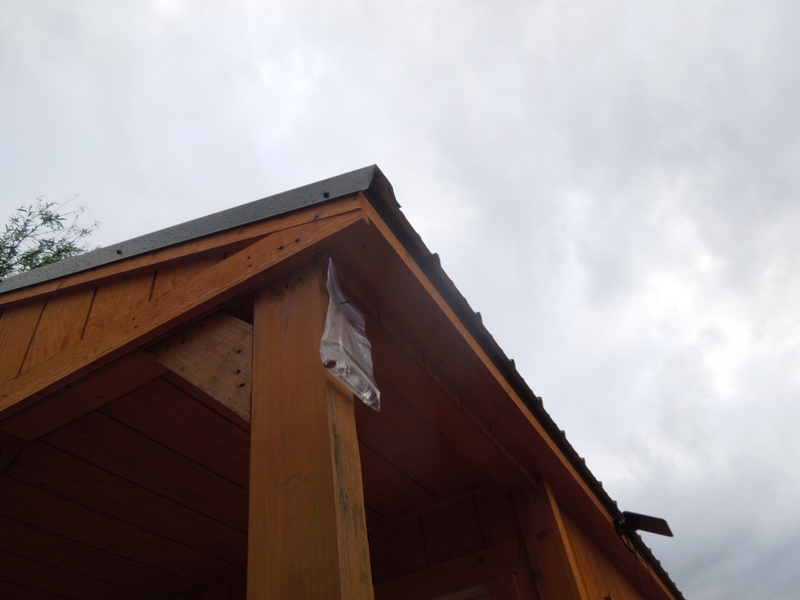 Now on to the bunkhouses…finally! Yes, it was a drive, but it’s what we had to do, and I didn’t mind – I would be driving through places I’d never seen, and they are beautiful places, so why not? 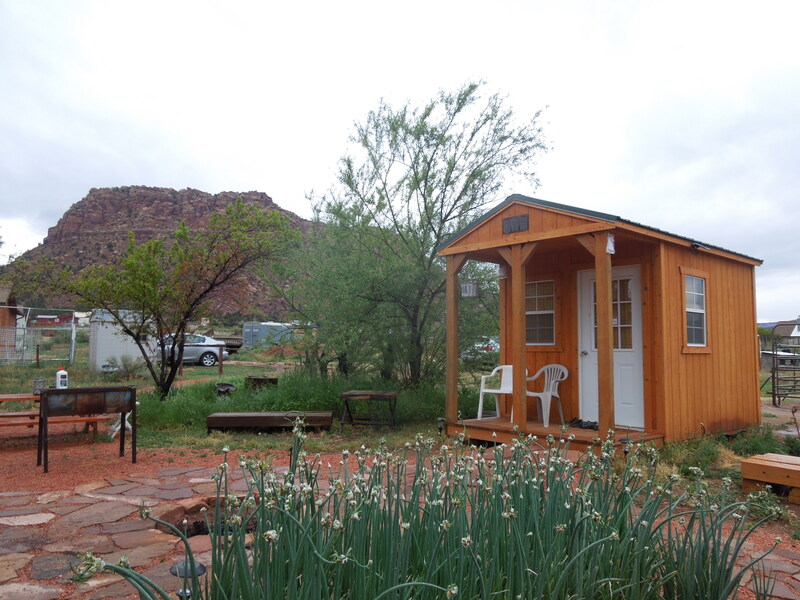 When I booked these rooms, I hadn’t understood how close they were to Colorado City and Hildale. As we drew near, I saw that it was just a few miles, so I said, “Time for a detour!” and I explained, as best I could, what the FLDS was all about. Trying not to think of Big Love, we reached the area, and I took a quick drive up and down some main streets, curious, I admit, to see what I would see. It was early evening, so there weren’t a lot of folks out, but I did see a couple of typically dressed women – in the long dresses and big hair – and the really huge, sprawling, but somewhat ramshackle houses, clearly added onto over time – were quite noticeable, and everywhere. The place had a shabby, tired, feel about it. They’re tiny and immaculate and have absolutely everything you need, including little solar-powered lights (that’s the panel on the roof on the picture directly below- they are good, I think for three hours at a high level and five at a low – I’m pretty sure this was it), bunks inside, a chair, a side table, and a propane space heater. The toilets were in a separate small outhouse/building and the shower was outdoors (behind a fence!). The boys had their own pad, and I had mine. It was fun. Supposedly this bag containing water and pennies repels flies. Hey, I didn’t see any, so maybe. This was the cooking/device-charging area. The only unfortunate thing was that it was rainy. If it hadn’t been, the boys would have spent a lot more time outside playing, and we would have been able to sit outside around a fire (the other people in the other bunkhouses tried to build one, but with no success.) But it was fine – very snug and a lovely little respite. And dinner? Cheese, crackers and fruit. I warned you, didn’t I! Now, on to Sunday and…WHAT TIME IS MASS ANYWAY? 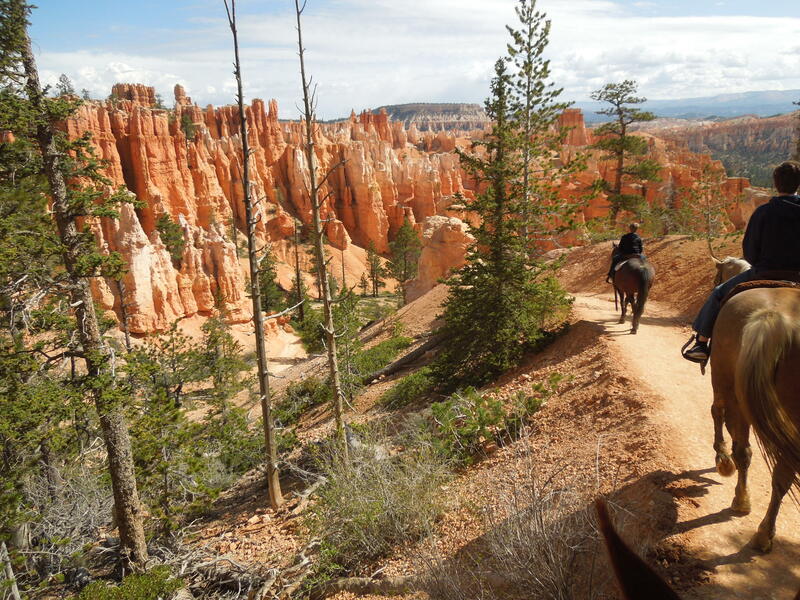 At some point on Thursday, I’d booked a horse/mule/general quadruped ride down into Bryce Canyon. You have two options: a 2-hour, or half-day trip. The half-day is really just about four hours. We opted for the latter. It wasn’t cheap, but it really was worth it. Despite my near-terror at times. You might already know this, but the thing about these creatures and the trails down into canyons involving switchbacks on ledges and cliffs is that their preferred path…is the edge. As in the outer edge of the path. With you perched on top of their hundreds and hundreds of pounds, looking down, watching them pick their way delicately along (did I mention?) the edge, dislodging gravel that you can hear tumble many feet in a downward direction. It’s the same at the Grand Canyon, and I read that there are something like 140 switchbacks going down (on the south rim, I’m thinking, since that’s the steeper side), and I know now I wouldn’t be able to handle that. 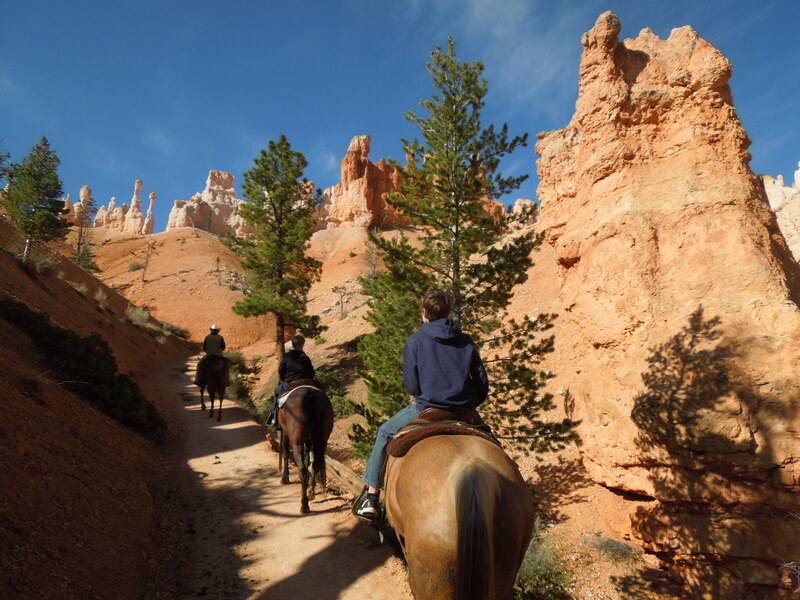 The ride left very early – we were supposed to be there by 7:45, and we were, gathering first at the Bryce Canyon Lodge, and then heading down to the corral where we’d be matched with our rides. There was one trail guide for about every 6 or 7 riders, it seemed. I got a mule – I don’t know what that says about me, but I did. The boys got horses, and they, being the only children in our group, rode right up behind the guide then me, then the other 4 riders. Don’t be afraid, nothing will happen, it’s safe, etc., etc. Don’t get too far behind because you don’t want your ride to start running to catch up. Because……? Better not think about it. Just keep up with the pack. The guide was a very nice, super-polite young man, who gave us a few tales about the canyon and what we were seeing, but honestly, not as much as I had expected or hoped – somehow, I thought it would be just a bit more informative regarding the geology and history of the area. Like anything else, it all depends on your specific guide, I suppose. And yes, I was a little nervous. It’s just nerve-racking, as the heavy beast plods along on the edge of a cliff. (Did I mention the edge?). It’s bad enough when the path is straight, but then you get to the switchback where the animal is going to turn, if not on a dime, at most on a half-dollar, and the gravel is rolling around and dropping..
…I’m glad I wasn’t on Comanche. But of course it was all fine. Every time. But I won’t deny that I was breathing easier when we finally hit the bottom of the canyon. And that’s another thing. 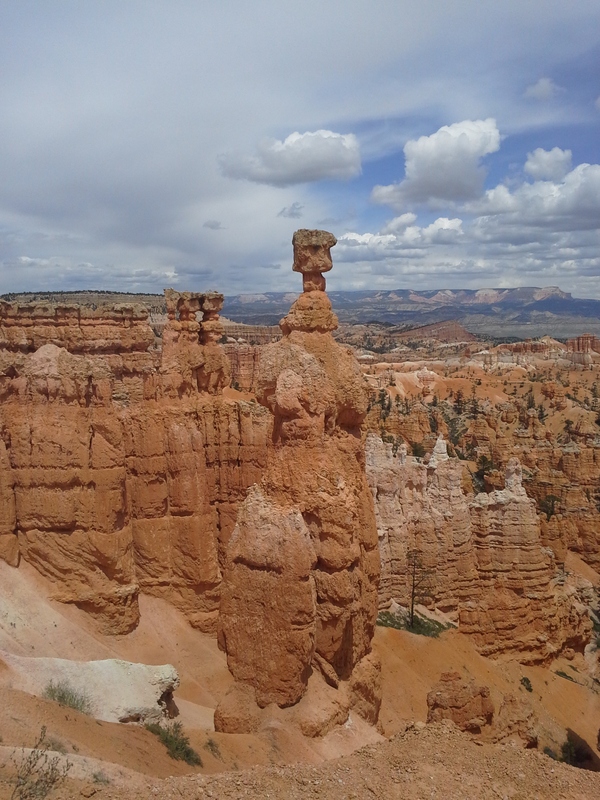 Looking at Bryce from the rim, I had thought that the hoodoos represented the whole of it – that the base of the hoodoos reached the base of the canyon. But no! Not at all, not even one bit. 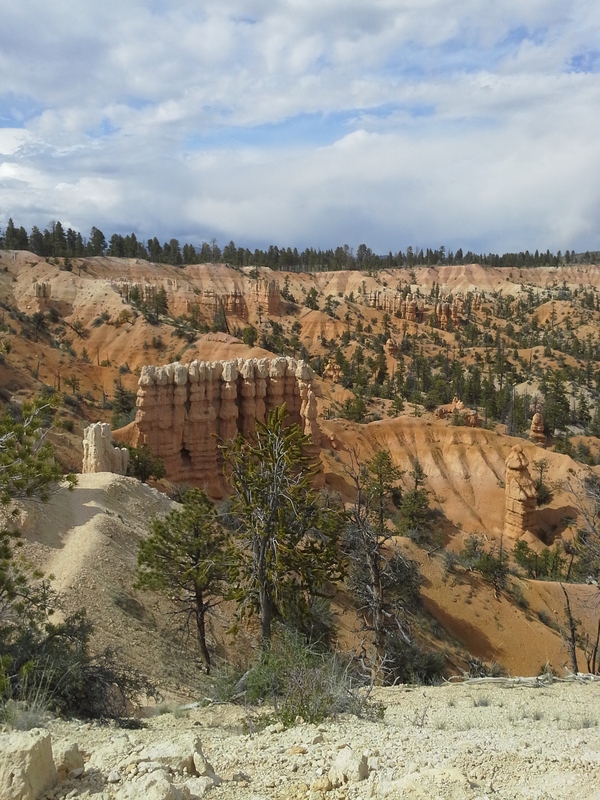 The hoodoos actually begin far above the canyon floor, which is lightly forested with some mostly dry creekbeds. 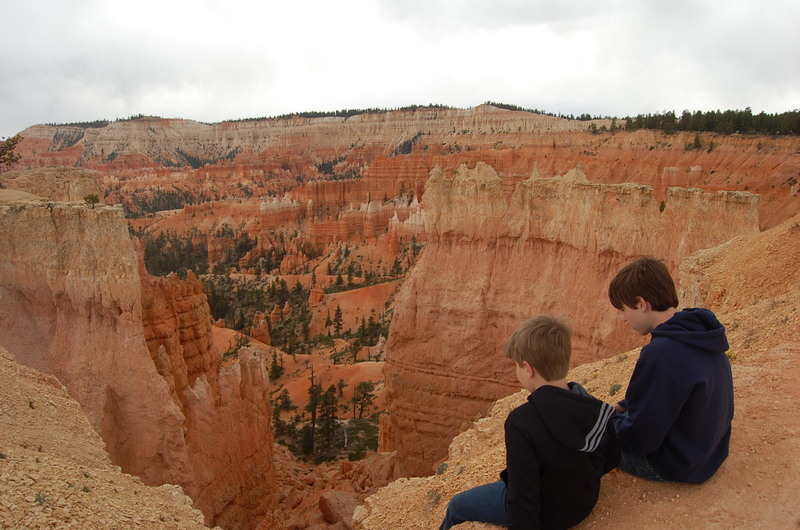 (Remember Bryce “Canyon” exists because of a freezing/thawing cycle more than water flowing at the bottom). It’s where we stopped for a restroom and water break. Despite my terror, I am really glad we did this. The boys claimed they weren’t scared at all, so good for them. I mean…good for them. I’ll write more about this later, but after going to the Grand Canyon, I can see a Rim-to-Rim experience somewhere in my future, but…I’ll walk it, thanks. No question. After lunch in Tropic (here – the boys really liked the hamburgers), the older boy was wiped out and was ready for a rest, but the ten-year old wasn’t near finished, so he and I headed back to the park to do some more hiking. First we tackled the Navajo Trail. Then, as we left the park, I saw the turn-off for the Fairyland Loop (which is actually before the pay entrance to the park), so we decided to check that out. If we ever go back, I would finish this one out. We just walked a little way out on it, since we needed to get back but the landscape and trail itself (see how it goes out in the middle there?) was distinctive enough, I think it would be quite interesting to follow. Back to the hotel – there might have been swimming that night – it was either then or the night before – in the substantial indoor pool at Ruby’s – but no overpriced buffet for dinner. There was a Subway a couple of miles away, so that would have to do – with no complaints from anyone. A common sight in public places in Utah. Everything you need. 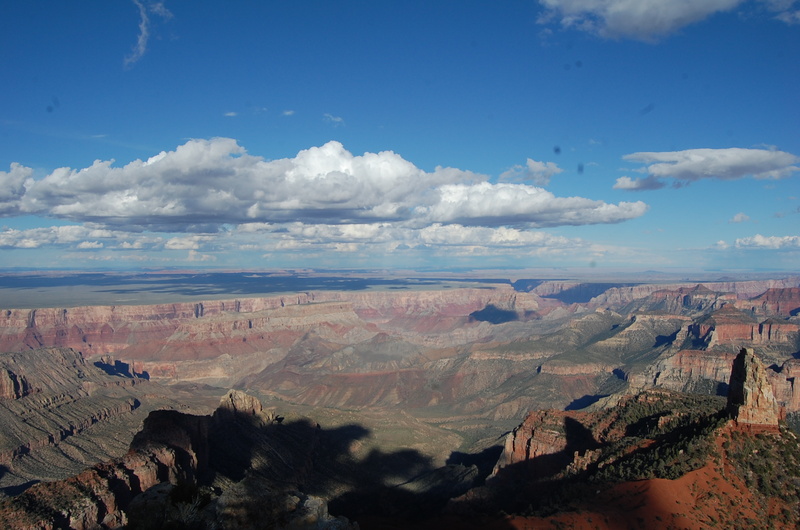 Tomorrow…heading south, on our way to the Grand Canyon…. It’s Thursday, May 21, and we need to get going, both back in history and in terms of these blog posts…. Now here’s an example of how it’s important, while traveling, to leave space and time for new and unexpected discoveries. At this point, the shape of the next three days was to be mostly Bryce Canyon. But since I had never been there before, I had no idea how much time we would want or need to get our fill of it. Would Thursday late afternoon and evening and Friday be enough? Or would that leave us aching for more and regretful that we didn’t have it? Would we want two full days? Three? The accommodations were booked – Thursday and Friday night at Bryce, Saturday night just over the border in Arizona, on the way to the Grand Canyon. But we could spend all day Thursday at Bryce (once we arrived)…or just the evening. We could spend most of the day Saturday, too. Hmmm. Decision time. 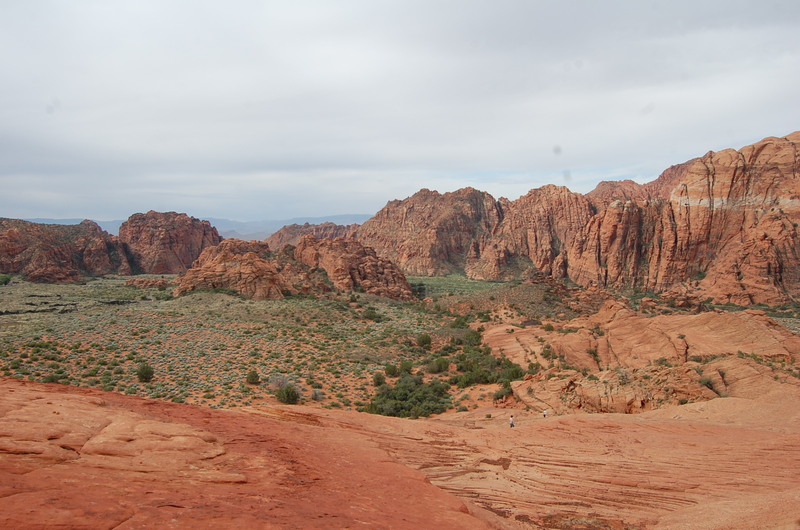 So, since we had that stretch of time open to us on Saturday, upon rising Thursday morning, I thought we might take a slight detour, head just fifteen minutes north of St. George to Snow Canyon State Park. We spent all morning there, and could have probably spent the day. It’s a gorgeous, fascinating landscape with lots of fossilized sand dunes, lava fields and white hills (hence the name). We spent our morning climbing over the dunes. 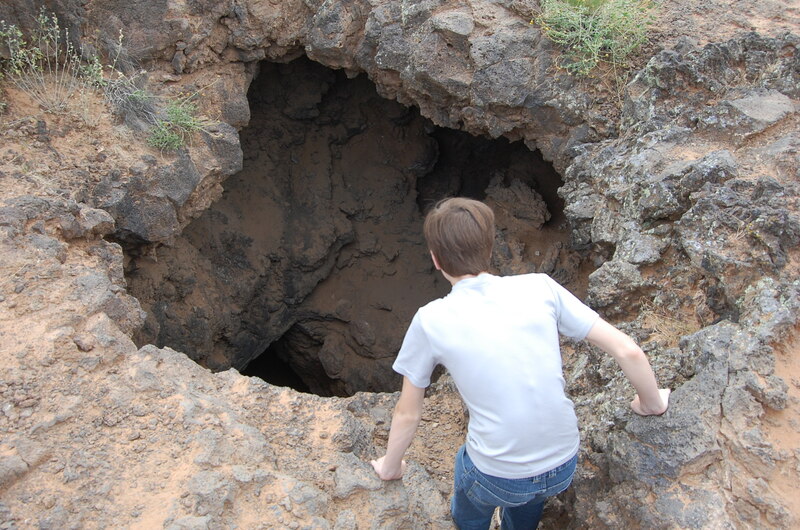 Then set out in search of lava tunnels. The trail to those tunnels is clearly marked at first, but somehow, we missed another sign at a crossroads – later, when we did find it, we all wondered how we’d missed it, but we did. No matter. That particular detour led, as detours often do, though, to one of the more memorable sites of our trip – a prairie dog stretched out in a bush, leisurely stuffing berries into its furry fat cheeks. We didn’t actually go into the lava tunnels because we weren’t at all equipped for it, and besides, I don’t do things like go into lava tunnels when I’m traveling alone with two kids. I’ll do a lot, but I always have the what if something happens caution in the back of my mind. I mean…there’s only me. Aside from my obvious safety concerns about my kids, sorry, but * I* have to stay safe. There’s no fallback. 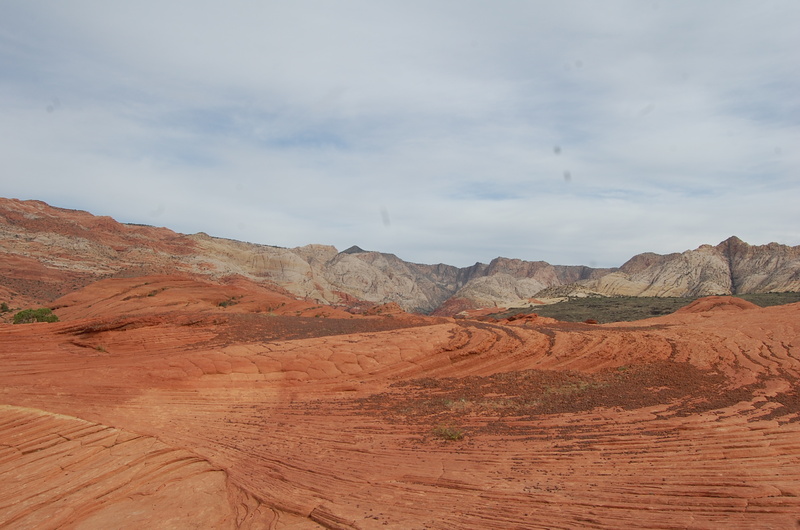 I believe I had read about this park before, but hadn’t worked it in because I was fixated on the big sites and, I’ll repeat, I had no good understanding of the distances, and didn’t realize that it was such an easy drive from St. George. It would be a great spot to spend an entire day…or two…. 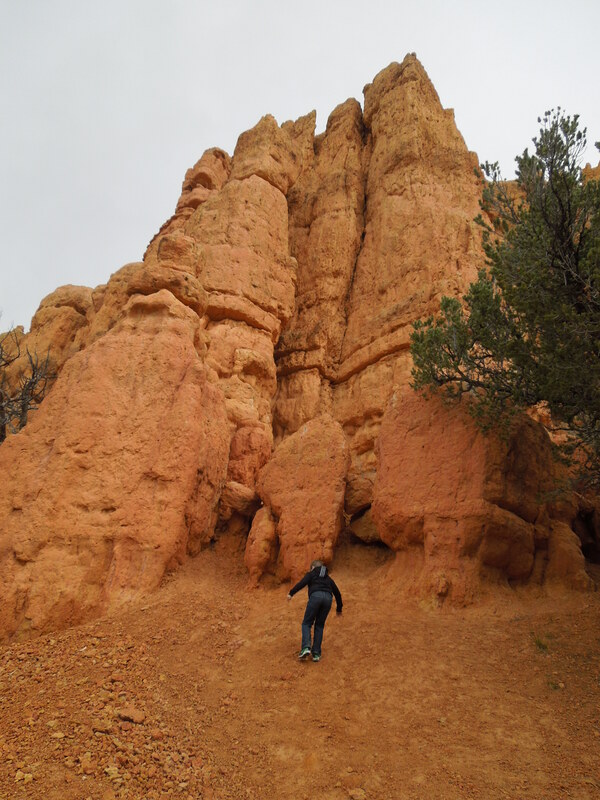 We finished up around lunchtime then headed back into St. George to the Chick-fil-A my son had tracked down, and then it was on to Bryce…. Which is amazing. Other-worldly, and quite out of the blue. You could spend your life living five miles away and never know it’s there – which is sort of what happened, historically. Almost every natural site we visited on this trip was a canyon or valley, but none were anything at all alike. 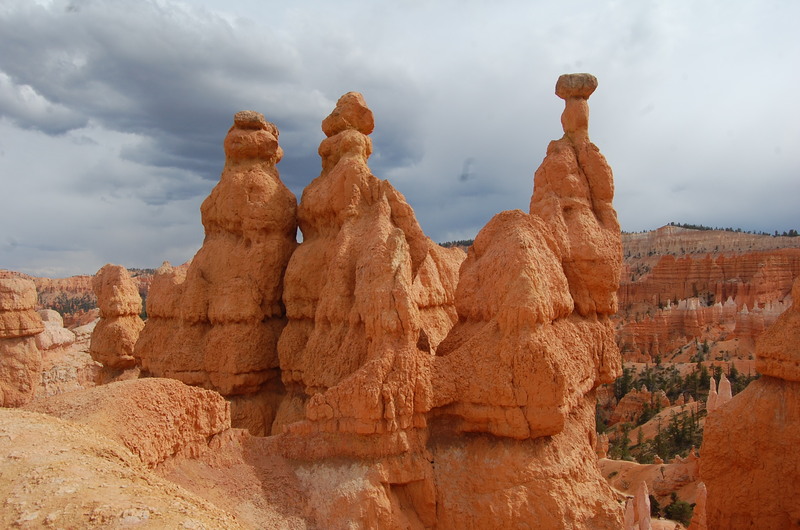 These hoodoos and other formations have been formed, they say, not by the wind-generated erosion like that which formed the hoodoos we saw in New Mexico, but by a particular process. Bryce is in an area subject to extreme temperature variations. During the winter, there is a lot of snow and ice, which settles into the rock. With all these temperature fluctuations and the presence of the freezing, then melting ice, the softer forms of rock crack and erode away. Let’s backtrack a bit. How did I get to Bryce? Well, I drove on the interstate 15, then up and over. For the next few days we’d be staying in accommodations that, I knew, held monopolies over the areas in which they were located, and prices on things like breakfast bars and snacks and fruit would be high (I was right). I wanted to avoid being gouged, so a side-trip to the Wal-Mart in Cedar City, Utah seemed like a good idea, and it was….and by the way, that was a bit of a shock…to get out of the car into temps in the high 30’s? What? 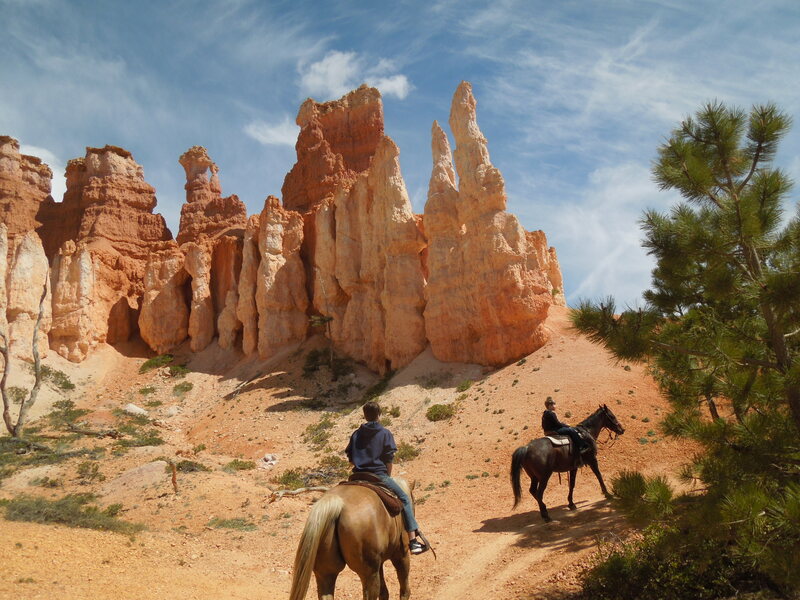 The drive to Bryce takes you through the beautiful and aptly named Red Canyon, which we would visit on the way out. Now, this part of the entry is for those considering visiting Bryce. I want to clarify a couple of points that were fuzzy to me before I got there and actually saw how things were laid out. 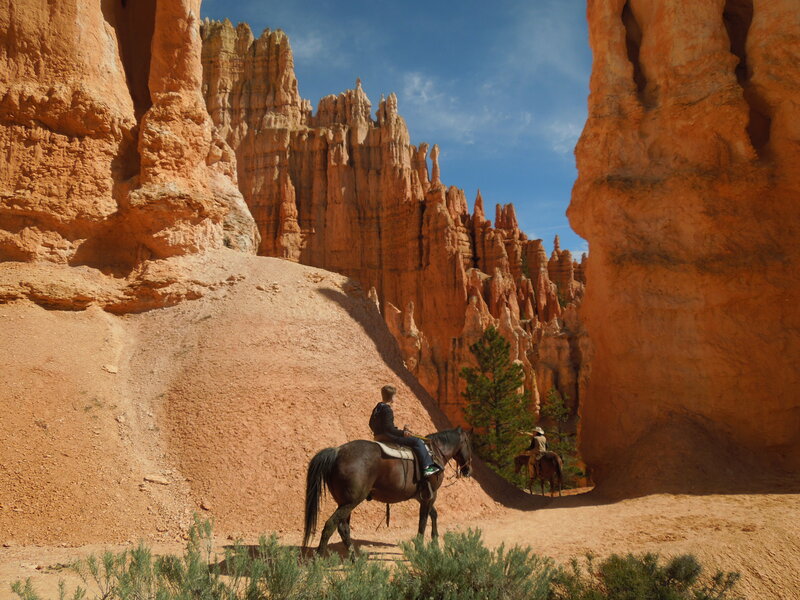 To stay in the park and the historic Bryce Canyon Lodge, part of the NPS, but operated by Forever Resorts (which also operates the Grand Canyon North Rim Lodge). This is, of course, right in the park, with hiking trails jutting off from it – great location. There are rooms in the lodge itself, plus a bunch of cabins, which looked nice. I checked here, but there was never any availability that popped up during the month I was searching. 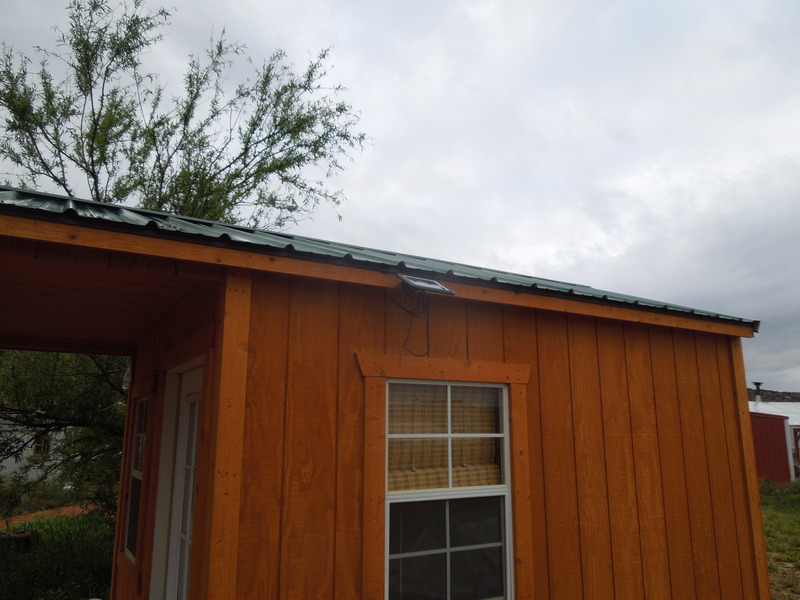 Note, there’s no internet at the Lodge. Moving out from there, you have the Ruby’s Inn complex right outside the park itself – and I mean, right outside. It’s a five minute drive from the Visitor’s Center. There are two hotels, a general store, a souvenir shop, a campground, gas station, etc. The hotels are now part of the Best Western chain. Super convenient, but you pay for it. Then moving maybe ten to fifteen minutes further down the road, off the Ruby’s Inn property, there are a number of smaller hotels, motels and cabin outfits. Of course, you can guess that the price of the accommodations increases, the closer you get to the park. The distance of the other, smaller, less expensive accommodations from the park isn’t that far, and the drive is very easy. 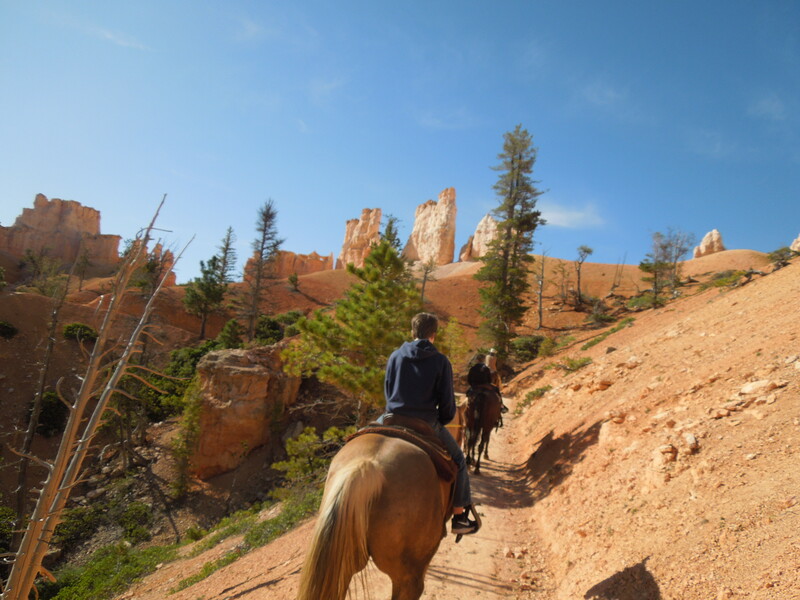 You’re not having to deal with winding switchbacks or driving through miles of nothing to get from those further-away hotels to Bryce Canyon. You can stay in a decent place for less money that’s fifteen minutes away on straight roads that are no hassle to drive any time of the day or night. The Ruby’s Inn complex is a monopoly – they own that property right outside the park (they were the original developers of the area as a park, and that’s all a very interesting history), and ….they hold that monopoly. Prices on food in both the stores and in the restaurants are very high – ridiculously high, even for an area in which prices do tend to be higher in restaurants because of a general lack of competition and the cost of getting supplies. I mean….$23 for a mediocre buffet for anyone over 11? I just wouldn’t want to get caught in that web again. Checked in, along with half of Germany and a third of Japan (amazing! ), and set out to explore. We drove into the Visitor’s Center, looked around there, then drove on down to a couple of hiking/walking trailheads. OH – forgot this. Admission to these popular parks is not cheap, and that’s okay, since they really are one of the things that we do best, and a big chunk of the rest of the world gets to us via these parks, so they’re worth the upkeep. Plus, Nature. It’s now $25 per private car. Because we were visiting so many of these parks on this trip, I opted to just go ahead and purchase the “America the Beautiful” pass for $80 that gets us into all federal recreation sites (that sounds….penitentiary-like, doesn’t it?). 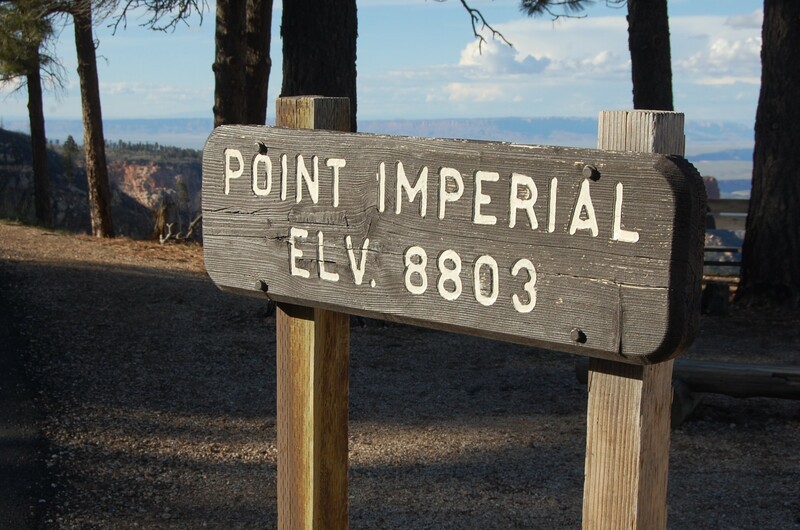 We drove out to Sunset Point, then walked the Rim Trail to Inspiration Point. Then we did a big chunk of the Queen’s Garden Trail. Then back to settle in a bit more, eat and then return to the Lodge for a nighttime ranger program on astronomy. We drove out to the Lodge, at which point I discovered I had the program time wrong, so we had 45 minutes to kill. We killed it by driving up through a good chunk of the park and stopping at various viewpoints. 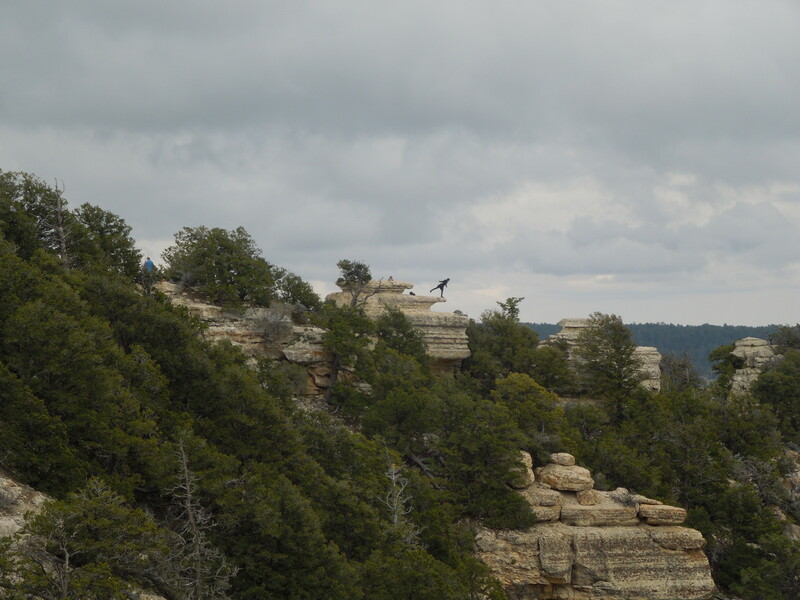 At one viewpoint, there was a very friendly, large raven. The couple that was there when we drove up said it just hopped right up to them. No fear. Obviously it has been fed by human beings, and this is too bad. It really was a little menacing, very Birds-like. When we went to our car it roused itself and flew right to our car, obviously holding out for one last opportunity. People are stupid. Don’t feed the wildlife. Please! Now, back to the Lodge for the program. I had been looking forward to this. In fact, I had scheduled us to be at Bryce on a Thursday night so we could catch one of these astronomy programs. It turned out not to be….the best use of our time for a couple of reasons. It was cloudy. This couldn’t be helped, but it did mean there would be no actual star-viewing. But surely the program would be worth it anyway? Sorry, no. We heard some ranger programs at the Grand Canyon that were very good, and this, unfortunately, was not anywhere near the standard of those. The well-intentioned, enthusiastic fellow spent an hour giving a sort-of history of the science of astronomy, most of which was familiar to anyone with a high school education and not engagingly-enough presented to interest anyone else. 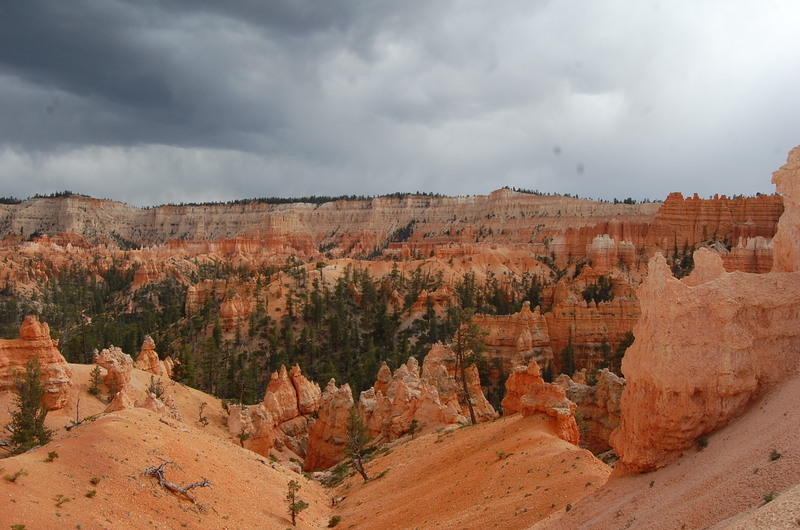 I had expected a presentation about the skies above Bryce Canyon in May – what’s up there, how to see it, where to look….and that’s not what we got at all. It was fairly torturous. Not a good start to the NPS Ranger talk program…but it did get much better, so stay tuned for that. But this would be awaiting us in the morning….so get a good night’s sleep!